So...as the rest of you are--I'm sure--I was really disappointed that Israel was not amongst the 32 countries represented in Germany this summer. 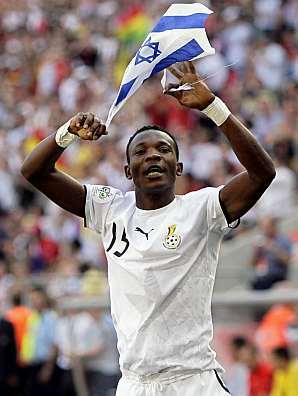 That was changed when John Pantsil of Ghana, who plays for Tel Aviv, displayed the Isreali flag after a Ghana's two-nil beat down of Czech Republic, he displayed the Isreali flag for a b-b-b-billion fans. Nice work! I have to say, I never thought I'd see the day when a guy with jew strings and side curls was on the "Top 40 most downloaded ringtones," not to mention it's the front page. Probably dozens of times a year, you'd find parents in Orthodox neighborhoods deciding to pick that name for their newborn baby girls. But Tom and Katie? Yes, that Scientology movie star couple of Tom Cruise and Katie Holmes picked the name Suri for their new daughter. They did, they said, because Suri has its roots in biblical Hebrew, is a variant on the name Sarah, which means "princess." That followed by a few weeks, the decision of movie star Gwenyth Paltrow to name her new son, Moses. As in, well, Moses. Somewhere in between the births of baby Suri and baby Moses were the debut of a new cable TV reality series, titled, "Shalom in the Home," in whicha rabbi gives marital advice to couples; and the selection by President Bushof Joel Kaplan to be his new Karl Rove, namely his chief advisor on policy. Kaplan was named deputy chief of staff. Couple weeks before that, Bush chose Josh Bolten, nice Jewish boy, to be his chief of staff. Meanwhile, over in movie theaters, we had the premiere of a major motion picture named, "When Do We Eat?" which is all about a Passover seder. In a couple weeks, it will be joined on the silver screen by "Keeping Up with Steins," which is all about bar mitzvahs. Which leads me to one question. What in the hell is going on? Or, to put it more delicately, when did the whole world become Jewish? Truth is there have been warning signs. Madonna studying Kabbalah, not holding concerts on Shabbat, visiting Israel for Rosh Hashanah. Roseanne saying she was planning a bat mitzvah. Rabbi characters showing up on "Late Night with Conan O'Brien." Two Orthodox contestants on "The Apprentice. "A top pop star recording a hipped up version of "If I Were a Rich Man." Mattisyahu, clad in black hat and tzitzit, atop the rap music charts. And more. So much more. All leading to one inescapable conclusion. Jewish is cool. Don't know how it happened, but it clearly has. When one of the biggest stars of all decides to name his baby Suri, when the hottest trend in TV, the reality show, stars a rabbi, when a White House under Bush, one of the goyest presidents ever, is being run by two Jews, when MTV is constantly playing videos featuring a Lubavitcher Chasid, we clearly are where it's at. Big time. I find that fascinating. I find that particularly fascinating in that we have done absolutely nothing to make it happen. Indeed, a good case can be made that Judaism has gone out of its way to not be relevant, not be with it, not keep up with the times, not be cool. No how, no way. There is a reason that so few young Jews find Judaism appealing. It's because we have done nothing to make it so, still rely to an obscene extent on that holy trinity of Jewish life, the Holocaust, Israel and anti- Semitism, to make Jewish life go. Problem is that those three things are so 20th century. Sad thing is that Judaism itself is ever fresh, ever relevant, ever full of appeal, ever able to renew itself, bring meaning to the life of an individual, every individual. It is a clear demonstration of the powerful beauty and wonder of Judaism that Judaism is so cool today, that top stars connect to it, that artists reference it, that people find wisdom in it. I am working as an English teacher with Korean students in Cambridge Massachusetts this summer. I was scrambling to get an apartment and I finally got one in the middle of last week. This meant that I had about 48 hours to figure out where I would go for Shavuot and Shabbos. Luckily enough my apartment is about a 20 minute walk from Harvard, so Chabad of Harvard was, for me at least, the logical first place to check. The rabbi was nice enough to invite me for all the meals and the Harvard Hillel was having services. Now, I am well aware that many people would only use Chabad as an absolute last resort. For many, the prevalence of those who believe that the last Lubavitcher Rebbe was Moshiach (they're called moshichists...I've invented that spelling) is a huge turnoff. It can be concidered... Its smacks of... Its kinda close to... OK fine, I'll admit it. Its idol worship. Me: Chabadniks are so much fun though!!! My Conscience (which has a Yiddish accent): "Nu, and I'm sure that those who vorshied de golden calf vere fun too." Me: Its not all of them... It might not even be most of them!!! My Conscience: "Nu, and you vould risk it?" I can't help myself. The warmth that radiates from Chabad is, for me, incredible. They're the happy Hasidim. Well, actually, Breslovers are happy too, but they disrupt traffic, write grafitti and rework already annoying Romanian pop songs. I think that having good experiences with Chabad assuages some of my irritation with all the bad experiences I had with Satmars growing up near Kiriat Yoel. What's worse is that the shliach types, the Chabadniks that go out into the world to encourage mitzvahs and to feed cheap hungry students like me, seem to be the most likely to be moshichists. Harumpf! So, back to last week. I had actually been at this Chabad house once before and had found that it was different than the others I had been too, but I couldn't put my finger on why. It was nicer, but that wasn't it. This is Harvard after all. It was an actual house and not a room in a basement. They stored their stuff in closets, not in cabinets and boxes next to the Muslim Brotherhood clubroom. But that wasn't it. There was something else different about this Chabad house. I was there for almost the whole of Shabbos and Shavuot and I still couldn't figure it out... Finally someone pointed out what it was and I slapped myself in amazement that I hadn't seen it before. THERE WAS NOT AS SINGLE PICTURE OF THE LUBAVITCHER REBBE IN THE WHOLE BUILDING!!!!!!!!! Not a single one. Can you believe that?! Maybe they had one hiding somewhere, but if they did I couldn't find it. I had finally found a Chabad house that didn't have one of those Rebbe pictures where the eyes follow you. I didn't ask, but I think it's a good bet that Rabbi Hirshy Zarchi of Harvard Chabad is not a moshichist. Baruch HaShem I have a place to go for Shabbos for the rest of the time I'm in Cambridge.